Mission Statement The Sedona Arts Festival produces a premier, annual fine arts festival which promotes awareness of the arts, supports artists, and builds community in the greater Sedona area. We financially support art programs and provide scholarships for our youth. Services and Projects Our annual October festival supports our giving programs. Scholarships for graduating seniors pursuing a career in art and grant monies for art education organizations are awarded annually. Help Us Organize the Sedona Arts Festival! The Sedona Arts Festival is looking for people who are fun, organized, and committed to help us organize our annual festival, held the second weekend in October every year. 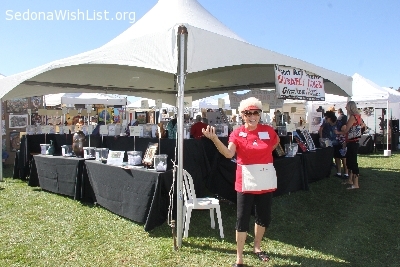 SAF is in its 27th year and produces Sedona's oldest and largest premiere arts event. This year's festival dates are Oct 7 and 8, 2017. RAFFLE TEAM - an organizational team (2 or 3 people) to put together our raffle booth. YOU DO NOT HAVE TO SOLICIT DONATIONS FOR THE RAFFLE. Our raffle prizes are all donated from the artists who are participating in the festival so you don't have to ask for a thing! We just need a few good organizers who can prepare, set up, and run the booth smoothly. We have an experienced group of volunteers to support you! SITE CREW - we are looking for a core team to take on all the logistics of the festival itself - field layout, artist set up, festival weekend logistics, tear down, and clean up. We have an experienced Site Manager to support you but we are looking for a co-chair for him. He has been woefully understaffed the last two years and we would so appreciate any help you can give us in this area! We are a fun and flexible group with a fabulous annual event. If you like us enough to join our Board of Directors, we are always looking for people to serve year round in our efforts as an organization. The Sedona Arts Festival financially supports arts education in our community through grants and scholarships. The annual festival is ultimately a fund raiser for that mission. We would love it if you would join us! Can't wait to hear from you! Golf Carts needed to borrow for Sedona Arts Festival on Sedona Red Rock High School grounds from Friday, October 10 through Sunday, October 12. These will greatly help our set up volunteer crew and artists before and during the festival! If you are able to donate the use of your golf cart for this good cause, please contact Rick Buck at 513-255-0302 or rickbuck48@gmail.com.